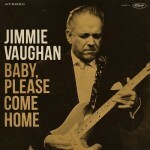 Like his old Fabulous Thunderbirds bandmate Kim Wilson, guitarist/vocalist Jimmie Vaughan displays a connection to the postwar blues/early r&b mojo that is borderline supernatural. The throwback instincts in evidence on his new offering- expressed via solid band performances, tasty backup vocals and the leader’s authoritative, less-is-more lead work are a consistent treat. The Lloyd Price-penned title track, Lefty Frizell’s “No One To Talk To (But The Blues)” and Richard Berry’s cute, catchy “Be My Lovey Dovey” stand out but top honors go to Mr. V.’s vocal on the T-Bone Walker ballad “I’m Still In Love With You”. Baritone saxophonist Doug James’ choruses rate mention as well.